We love working on IKEA kitchen designs for customers from all around the world. This week we talked to Rocio from Lafayette, CA, who took time to share some of her experiences working with us on her kitchen remodel. Thanks Rocio! So why did you select IKEA’s cabinets? Modern look, low cost, great value. We did not trust our own skills with the Ikea design tool (also, it is a terribly clunky tool) and we did want the input from someone with experience in designing kitchens. The efficiency of the process and the very reasonable cost made IKD an easy decision to try. No, we took great pride in being able to say that Rocío built 90% of the kitchen herself. Ernst did a little bit too. We enjoy putting together Ikea furniture and felt a great sense of accomplishment and ownership from doing this ourselves and get our organic wood look IKEA kitchen. Because we were doing a large remodel that included moving walls, we had a lot of flexibility in the design up to the very end. This actually made things more difficult as we worked with the dimensions as they would probably be… needing to leave enough flexibility in the plans to accommodate for inevitable mismatches of an inch here or there. Also, we worked with Semihandmade’s Classic Flatsawn Walnut for the fronts, and so every change in our plans had to be worked through the IKD design, the Ikea shopping list, and the Semihandmade order. But: it all worked remarkably well. That things would not end up fitting the right way at the end. I used ideas from Houzz, kitchens that I saw in magazines or from friends’ houses. I wanted to have a very organic wood look IKEA kitchen combined with a very modern white cabinet style to give the effect that was looking for of a young urban style. We’re tallying it up as we speak! Ceasarstone (quartz w/ polymer), bought through IKEA. 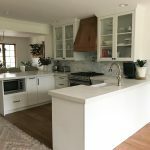 In addition, there was some drama there because of miscommunication with the countertop installers and a batch of bad material, but IKEA helped us and advocated for us throughout the process. Any words of advice to future IKEA kitchen remodelers? First, buy a couple of extra handles, because they do rotate them out of the collection. Second, make sure you heed the standard spacings as much as possible to cut down on custom work. We customized a space above the ovens, and also had to cut a few handles down to size to allow drawers to open in corners, etc. We made it work, but they were a headache, finally we´re able to get our organic wood look IKEA kitchen. Thank you again Rocio & Ernst for sharing this great experience! If you’re looking for a custom IKEA kitchen design, talk to us. If there’s one thing we want our customers to know, it’s that an IKEA kitchen is affordable luxury. Case in point: Beth and Jim’s brand-new European style IKEA kitchen. Yes, Virginia, they are all IKEA kitchens! An IKEA kitchen is affordable luxury if you know the recipe. In the 1950s, ads for Clairol hair dye asked “Does she…or doesn’t she? Only her hairdresser knows for sure.” Women in the 1950s didn’t want anyone else to know they dyed their hair. If you find yourself exclaiming that when you see the photos of Sabrina and Chris’ (almost completed) kitchen, we can’t say we blame you. 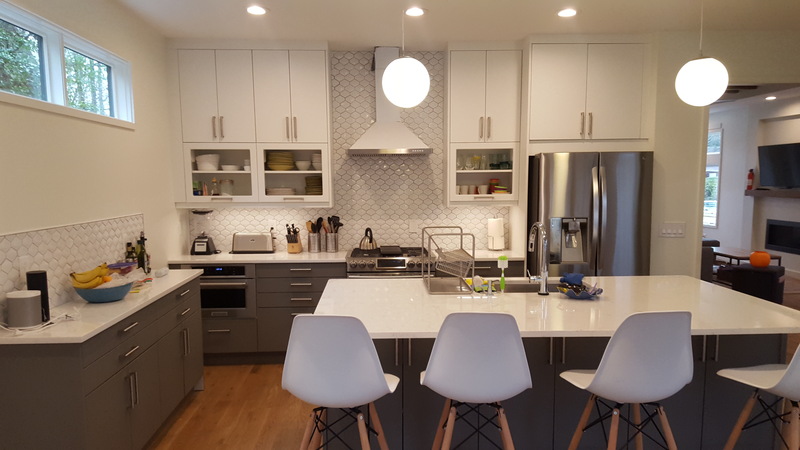 Chris and Sabrina’s IKEA kitchen came together with the help of architect Jordache Avery, Semihandmade doors, Custom Assembly & Installations, and – of course! – IKD. Early on, the kitchen remodel morphed into an outright teardown and rebuild when the couple opened the walls and discovered considerable fire damage. So we don’t have “before” photos – sorry guys! – we think you can agree the “after” photos are dramatic even without them. Nowadays no one blinks an eye over hair dye. 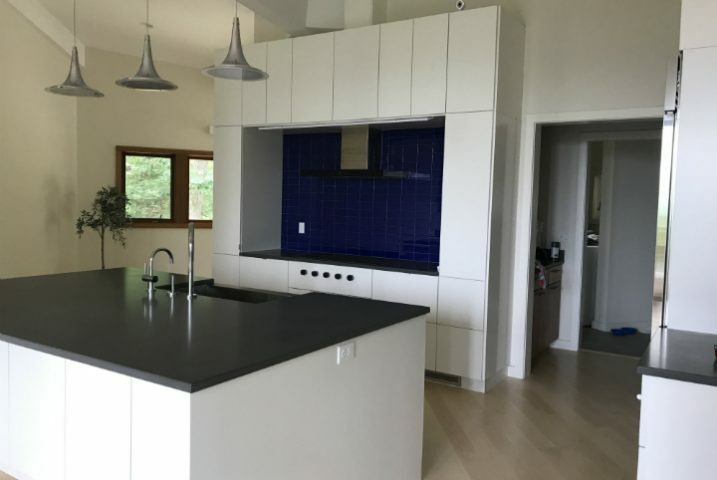 We think IKEA kitchens like Sabrina’s are paving the way toward making beautiful kitchens affordable again. Linda and her husband were empty-nesters getting ready for retirement, and a smaller, single-level home was their top priority. Second priority? A new kitchen. 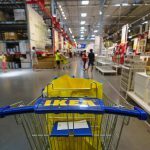 So why an IKEA kitchen? Linda’s younger daughter had just redone her own brand-new IKEA kitchen. Linda was impressed with the hardware, the price point, and the end result. It was a perfect fit! The old kitchen had low-quality materials and a dated look. The final nail in the coffin? It was completely walled off from the rest of the house.Yikes! Linda knew that she wanted to incorporate elements from her last house to make the new place feel more like home. 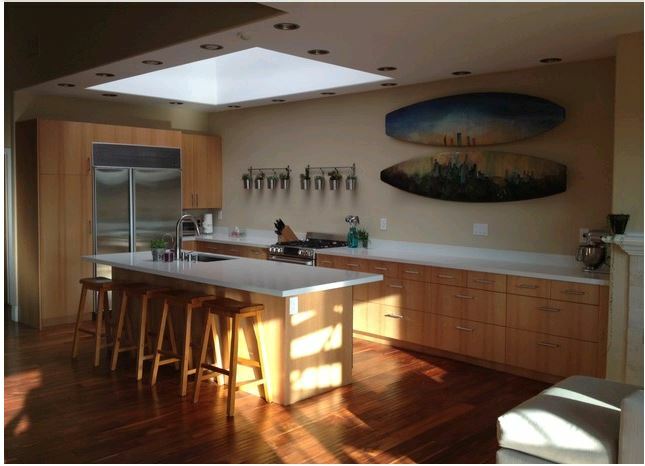 She had her heart set on light maple floors to replace the dark brown wood, and lots of skylights to brighten the kitchen. How’d we do with this IKEA kitchen design? Alyx and her husband’s lake home was a new build in upstate New York, so they started with a blank canvas. They hired an architect to design their open-concept home, and brought in IKD to figure out the IKEA kitchen details.